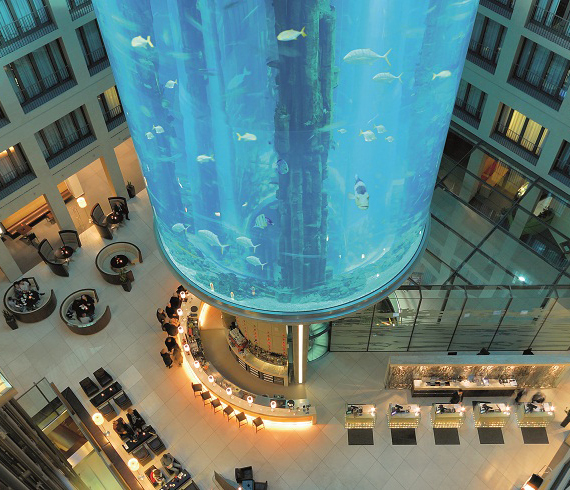 There’s an aquarium in the lobby of the Radisson Blu Hotel on Karl-Liebknecht-Strasse in Berlin. It’s just down the street from Museum Island, and after a stint at the Pergamon Museum with our holiday guests, M’s brother Geoff took us a block out of our way to step into the lobby of the Radisson and observe their massive water tank filled with fish. We noticed a group of people milling about on a platform under the tank, and we weren’t sure why they were assembled there, but after a few minutes the whole tiered platform they were standing on began to rise slowly into the tank, causing everyone in the lobby to sigh “Aaaah!” Soon we could see the hazy form of humans through the thick glass and blue water, but only just barely, and we could not see the glass core that girds the tank from the elevator at all. Watching them, it occurred to me that being an American living in Berlin is a bit like being in that elevator in the tank, immersed yet fully dry, having the illusion of being steeped in a strange new world, yet ever aware that an invisible barrier shields you from full contact with the environment around you. We were invited to a New Year’s Day brunch by my friend Anne, and standing in the shower the other day this thought drifted through my head, “We’ve been inviten” and I stopped rinsing my hair for a moment in confusion. Is inviten the past tense of invite? I quickly retrieved the word invited, but the brief loss jarred me. Maybe it’s Berlin’s liberal use of the word verboten that tricked me, the common infinitive ending en, but the part that got me is that I’m not even really trying to learn German. I’m somewhat willful that way; rowing sessions are my immersion classes; turning on the radio now and then I get a blast of the local language, and I overhear snatches of conversation on train platforms and the upper level of the buses through town, but I have no systematic program at all. Yet even so the pattern of the local language is making its imprint and beginning to steal away the English words I know to be correct. Perhaps if I stayed here many decades I would one day would find myself in a conversation with someone American and not feel comfortable conversing with them in my own native language, so influenced over time I must be by the one that surrounds me. Maybe I’d be like the British woman at the market at the Zehlendorf S-Bahn station who did not want to speak with me in English, apologized for the words she could not come up with, leaving me to supply her with the word “cream” for sahne, for one. She’s been here that long, no longer conducts much business in English, and the lack of use has clearly nibbled at the edges of her vocabulary. Family friends came for a brief visit this fall and I told them of my befuddlement at trying to order pizza from an Italian man in German, how the only words I could squeeze from my addled brain were French. One of them said kindly, “It’s really all one big language”— influences come and go and shift and nudge other languages until they’re all one big steaming pot of words, and for some reason I found this comforting. In early December there was enough snowfall back in St. Paul to warrant a snow emergency, meaning everyone had to move their cars in coordinated fashion to enable city workers to clear the streets. I forwarded a neighborhood email about the snow emergency parking plan to our renters urging them to move their car around the corner by 8 a.m. the next morning to avoid a ticket and towing. Meanwhile there was a hurricane bearing down on northern Germany of which I was utterly oblivious. It was hovering over southern England, gathering steam on the North Sea and heading our way; our family went about our business in total ignorance of the news. Radio and television are all but silent in our house, and news reports in German won’t do us much good anyway. No newspaper hits our doorstop each morning. But we have friends who look out for us; a former intern in Augsburg sent me a note about the projected wind speeds of 140 km/h, and a friend in Berlin sent me a link to the weather report and map in English, and with these interjections the fuzzy world around us clicked into focus. So when the wind began to pick up and the S-Bahn service ground to a halt and after-school activities were canceled, we were not as surprised as we might have been; through one channel or another, the forecast was going to reach us before the storm. Walking through the city back to our flat after seeing the hotel aquarium with our holiday guests, Geoff pointed out the grounds and residence of a stately manor that he then identified as Germany’s presidential palace. This struck me as odd, because I knew that Angela Merkel was the chancellor and kept a rather humble apartment near Museum Island and did not use the term president. I realized there was a gap in my understanding of Germany’s politics so I admitted as much to Geoff, swallowed my pride and asked as casually as I could, “So, who is Germany’s president?” And thus I learned about Joachim Gauck, president of Germany, who holds largely ceremonial duties, whereas Merkel is more akin to a prime minister. Days later I pulled up Der Spiegel on my laptop in English to read the news of the day, and there at the top was a picture of Gauck and Merkel shaking hands, two German leaders in one place at the same time, clearly labeled president and chancellor. Surely seeing this would have tuned me in to his existence had Geoff not already told me, and so one way or another I was going to gain this cultural literacy. There is no magic class that will bestow fluency upon you, that will dispense all the cultural references you need in one fell swoop, show you step-by-step how to resemble a German. Undoubtedly there are straighter paths than ours; there are conversation classes at the Vochshochschule down the block that I could attend; Der Spiegel is updated daily. Yet even through the random smattering of German we do get from family acquaintances, didactic conversations with friends and family, and merely walking down the street or sitting in a boat, we are learning as if by osmosis, and the words and the culture and the history and the politics are swilling around us, and I feel a bit like a cat in a sink who doesn’t perceive that the tap is filling her basin. If our German immersion experience is like being in that glass elevator in the aquarium, I would not be surprised one day to find water pooling around our ankles and fish flopping at our feet. This entry was posted in History and culture, Sabbatical and tagged aquarium, Berlin, elevator, Karl-Liebknecht-Strasse, language immersion, Pergamon Musuem, Radisson Blu on January 2, 2014 by Jill M..